UPDATE – Cam commented on this post last year and I adjusted the code but never posted the update. I’ve posted an update for dock shortcuts using WebDAV but some people might still need to use these ones so I am updating the code to make it a bit better. Now it falls over to enter a different username if the local name is wrong, it also improves the original posted code by ignoring the mounted drive if it’s already mounted and also mounts directly to the user folder instead of also showing the top level Home$ share. Oh yeah it also opens a finder window to the base so you can just click it when ever you want to bring up a finder to the share folder. So there are a few of these out there and it’s usually a techs first delve into Mac when they get asked to create a short cut to connect to a file share. Simple connections to afp or smb shares are easy but then you hit a wall when you get asked to make it connect to the specific Users folder. 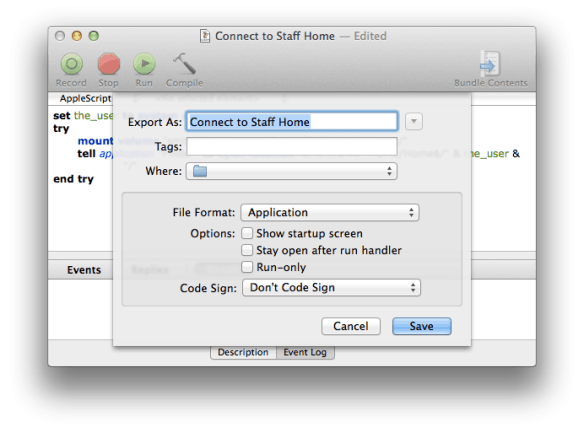 Open AppleScript Editor and paste the above in. Adjust the name of your share appropriately – this will not work exactly as is unless you work at the same place as me or you happen to have the same setup. 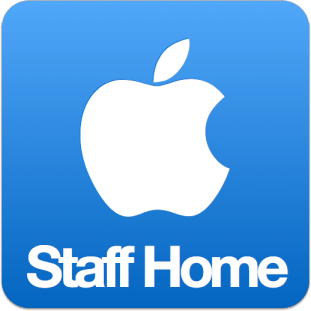 Using the Keynote trick you can make a high res icon for it – once upon a time there was a a bunch of effort required to do this but now it’s too damn easy. Right click the new app and Get Info (command+i), click the icon so it has a blue highlight and then paste your image – icon done. 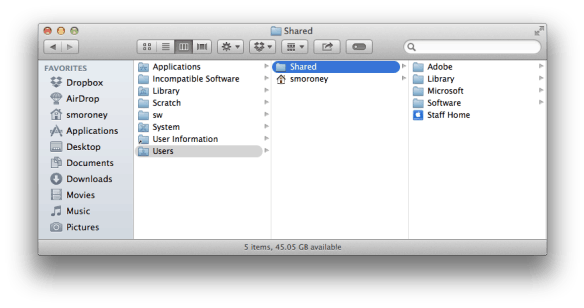 Now to finish off, when you store the new shortcut you’ve made put it in your /Users/Shared folder. Once you’ve installed it there and changed the permissions in the Get Info to be re Read&Write for everyone. It can now be dragged to or MCX’d to anyones dock on that Mac. The reason for the secondary line in the script is so that when a user clicks the shortcut it will open a finder to the folder rather than just mounting it. I honestly should go and add some error checking and also put in some dialogues for failure to clean it up. I should also do a check to see if the drive is mounted already to skip that step if it isn’t needed, as then it would become the button that a user can click to bring up the share space every time. I have so many things to write and I thought I should start off with one of my favourite tricks on Mac. This works with any version of Keynote and I’ve even tested it with the new released version 6. 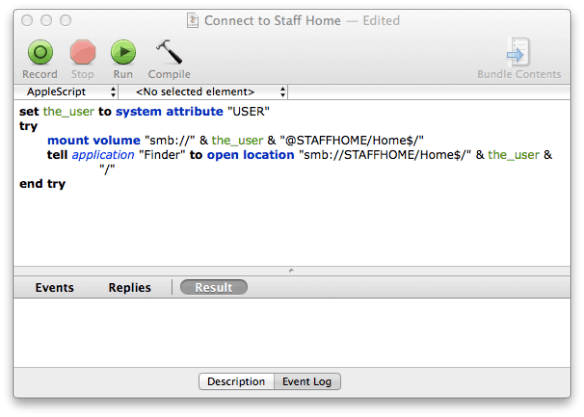 You need to have Messages too (previously known as iChat) but you don’t need to be logged in. Well also assume you all know the “command + shift + 4″ to screenshot and that if you do that and before you drag press “spacebar” and you get a camera that screen shots just the window you’re hovering over. This trick isn’t specifically for websites, it’s for creating images quickly. I end up having to do a lot of quick mockups and design and Keynote is my 2nd stage, yes I still scribble things with pen and paper to get my initial thoughts down. This leads to an issue where my thoughts look great in my mind and like a horrible mess on paper. Thus Keynote is where I end up skipping a whole bunch of time and professional level skills by using it to be me wire frames and to help create images quickly. Yes I know it’s not meant for that but it is faster and easier than any other editing program I can think of and the interface is something that almost everyone has seen in some form. You now have a png with transparent background if you need to adjust any wording, font or reuse it you can save the Keynote and copy paste when ever you need. You want a banner image saying “only 3 spots left!” (initially it had multiple !!! but that looked a bit crazy/desperate) and it needs to be sent to someone and put onto the flyer they’ve made. They want it so it doesn’t have that silly white rectangle around it cause it makes their flyer look cheap (like excessive !!! do). So it’s something really simple and they could use Alpha to get rid of it but lets pretend they’re on a Windows machine using Word and then we’re in trouble. Normally at this stage you’ll be ready to give up cause it’s too hard. Learning Photoshop is beyond the time you’re willing to invest and there’s a person you know who can make graphics and they’ll be able to open it in photoshop and fix it. I’ll add screenshots and a video coming soon and you will see the simplicity of the workflow and then realise how quickly and easily you could make incredible stuff. So lets pretend that a friend has asked me to create a new look for his Jump Page, and he wants his hover buttons to have rounded corners and writing on them with some type of simple icon as well. You have an idea and just want to test out how it will look before you open up Adobe Illustrator and start creating your vector image using the pen tool. Most likely not you reading this but it might be. So you don”t have to invest the hour or so tweaking and punching meshing and joining pathways you can knock out a quick mockup in Keynote. You want to take a few free vector images and layer them to crete a new stylistic logo for lets say… a student run help desk called Gravity. You can tweak and adjust as needed, remember if you start out creating the Keynote in a large format (1920×1080) and use the whole space up – your image might end up a high enough resolution for most purposes. If you need specific size then just go for an upscaled ratio in the Keynote, create an empty box and enclose the shape or area you need. Once you have the oversized but in ratio PNG on your desktop, open Preview go to Tools and select Adjust Size and set it to what you need. Sometimes you might want to create a PNG to use as a layer – creating a PNG makes it an image which means it can be resized, you’ll discover how useful this can be when you start making more complex images. You can just send them in Messages too, I had to mock up some ID cards and had the client on the end of a Messages conversation. I only needed to tweak on the Keynote and then paste into the message and he got each version as an image in full resolution. I ended up with a Keynote full of different options to build on if I have to do a similar project and he got instant mockups of the ideas. If you’re using Keynote 6 and consider yourself proficient then check out the new Draw with Pen tool under the shape option. I’t so good I’ll make a post and video just for the potential it has. Combined with this and … just wow! So another “this happened to me today”, I was working on a Pages document (Apple Mac iWork) and when I tried to share it as an ePub I had a problem because it didn’t like the movie file format I had imported. 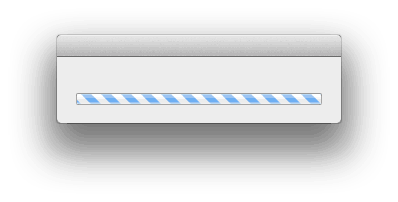 During the export, it shows the dialog almost finished, right near the end but it gets stuck. Pages has stopped responding and being patient as always I left it in the vain hope it would repair itself given time, my patience lasted 15 minutes of listening to my MacBook Airs’ fans flying at full tilt and I force quit. Ok this is where my problems started, I open Pages back up and it brings up the same export dialog only now with no text and it basically ends up modal so I can’t do anything. A bit of searching around can’t seem to find anything, the right search terms are hard to get google to find anything on it. Ask a few friends and then finally I stumble on an awesome tip squirrelled away in a Apple Forum asking about a completely unrelated problem. No, seriously this works. Doing this makes Pages open up the Open Document dialog and this takes precedence over any Application Save State. This also works with Numbers and Keynote when they have the same type of hanging. From there just open the Pages document that was hanging and close it again. The reason this works is because the Application Save State is overridden meaning you can open up the document that was causing the hang and close it, essentially re-writting the Application Save State when you save the document. Thanks to Dave Moyle for the location of the Application Save State and offering another way to resolve the issue e.g. 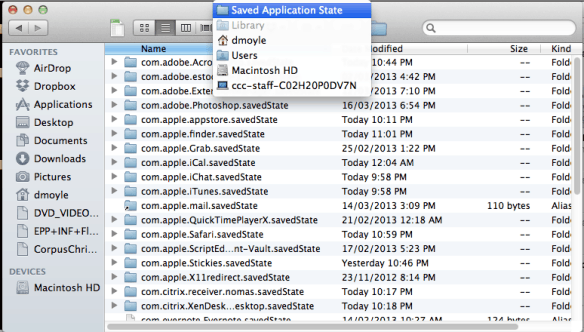 – find the Application Save State and delete it. Really just the same option as above but for those looking for a terminal command to do this – why are you looking? you should already know how to do this if you’re going to try this. Update: The layout of the Evernote app has changed and the steps in this article no longer work. Not exactly what you expect for me to consider awesome huh? You’re looking at a section of Evernote that stores notes that have been deleted – I don’t know how long they end up in there and how many but I do know that I found a deleted Evernote in here! I couldn’t import the note but it has the text content stored as html and you can copy paste that right back in – I couldn’t get back the attached image though. Hope this helps someone out there, I’ll also haven’t completely managed to get the DropBox syncing to work yet so when I figure that out I’ll step through what I found out.